@ IN SOA domains.dns.enum.mojeid.internet. nic.cz. How could eIDAS help Czech companies in Slovakia? In just a few days, all entrepreneurs in Slovakia will have active electronic mailboxes, which is the counterpart of our data boxes. Although the inspiration from the Czech system is obvious, there is at least one significant difference. While it is possible to sign in to the Czech e-Delivery solution using a username and password, in Slovakia, login via the citizen’s electronic ID card is mandatory and is the only option. This becomes a problem for about 10,000 (according to some estimates up to 12,000) Czech entrepreneurs who need to access their Slovak mailbox. If we omit the option of acquiring Slovak citizenship, another one (strongly recommended by the Slovak government) is to act by proxy – a Slovak citizen who has a local citizen’s ID card. The last (and not always mentioned) option is to obtain an alternative authenticator on a chip card with limited functions. At this point, some may wonder if the eIDAS Regulation could help. A way of simple linkage of Czech and Slovak data boxes would seem logical. Both systems are quite similar, and the number of Czech companies in Slovakia and vice versa is quite high. Unfortunately, eIDAS is not of much help in this regard. Although there is an e-Delivery arrangement in Articles 43 and 44, unlike electronic signature or electronic identification, a mandatory interconnection or cross-border recognition of data messages is however not required by eIDAS. On the other hand, further eIDAS provisions reveal that the obligation of (cross-border) recognition of the eID will not be effective until September 29, 2018. This recognition has one important hitch, too. It only applies to so-called notified eID systems, and the only country that has made such notification by the beginning of this year was Germany. A few days ago, the President of the Czech Republic signed an amendment to the Act on Identity Cards, which introduces ID cards with chip free of charge, but due to the postponed effectiveness of the law, we have to wait for them for another year. The Electronic Identification Act, which is to establish the so-called National Identification and Authentication Point (NIA), could be our hope for facilitating the access of Czech entrepreneurs to Slovak electronic mailboxes. This system should allow signing in not only with electronic national cards but also through other tools such as mojeID. However, Czech entrepreneurs still have to wait for the possibility to use it for signing in to Slovak data boxes. 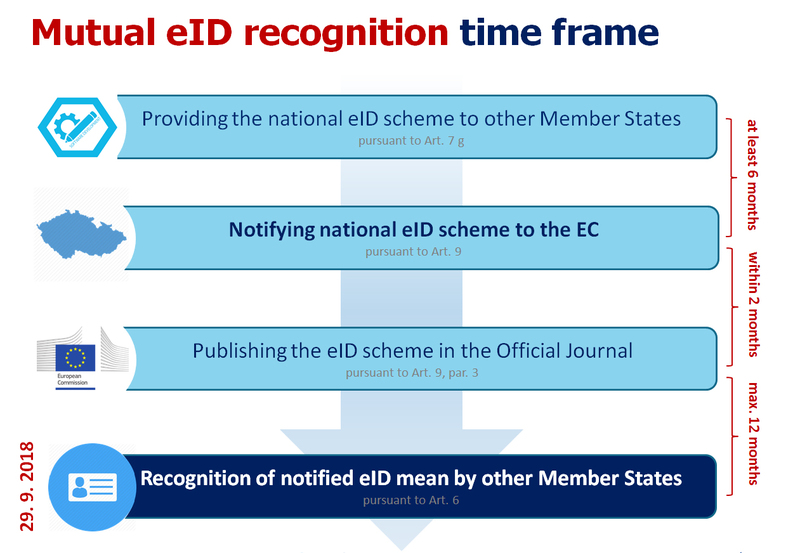 Just like the amendment to the Act on Identity Cards, this regulation also has a postponed effectiveness until July 1, 2018, and there is also a minimum 18-month period that must elapse from the first notification (pre-notification) of the system before it can be recognized in another country. If the Ministry of the Interior manages to submit a pre-notification by the end of this year, Czech entrepreneurs should acquire the possibility to sign in to the Slovak electronic mailboxes of their companies using their Czech national ID cards or hopefully even mojeID. However, thanks to the proactiveness of their government and the submitted notification, German entrepreneurs will have this option starting next September. All fields are required. Email won't be shown. Selected blog articles were published within the project solution co-financed by the Connecting Europe Facility of the European Union (CEF).